A customer in the N.T. 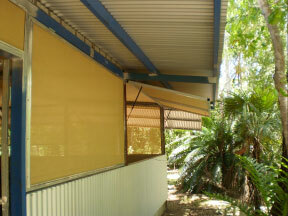 used our ShadeGrip on his windows using Shade Cloth instead of Flywire. He had great success with the product and was very happy with the finished product. "The shutters have performed very well. 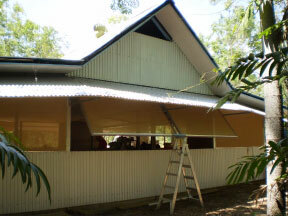 Not one of them budged during the cyclone last wet season and they keep rain and insects out of the house when they are closed. "Some two weeks ago I contacted the V-Grip® office by email regarding a problem I had in obtaining the plastic inserts in the V-Grip Frames. I had tried unsuccessfully to purchase these in several hardware stores, both large and small. It occurred to me to contact V-Grip® to enquire as to where I could obtain these pieces. Within an hour of sending this email I received a call from a young lady enquiring further into my problem. I explained that the V-Grip Frame had been in use for 15 years, withstanding high winds and rain etc. a dnduring this time had never faltered or caused any problems whatsoever but I had noticed that one piece of the plastic had gone brittle and was breaking up. Without hesitation I was told that the replacement strips would be put in the post for me that afternoon. True to her word the replacement strips arrived several days later without a charge to me whatsoever."